James Lindsay, the current CEO of Royal Vauxhall Tavern who leases the building from Immovate, has agreed and signed a 20 year lease deal with the property company, securing the future of the RVT as a London venue after protracted negotiations. The new lease replaces the older short term lease which was due to expire in 2019. Happy 50th @TimeOutLondon. We are honoured to be one of your 50 iconic places. Thank you! Click here for the full article. Wonderful news! In addition to the 5 BOYZ AWARDS won earlier this year, The RVT have been awarded MOST LOVED LGBTQ+ HANGOUT in the TIME OUT LOVE LONDON AWARDS. Thank you, as always, for your continued support and love for The RVT. 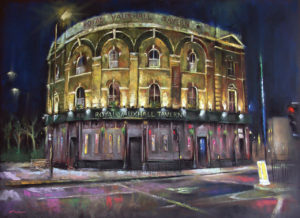 London based artist Marc Gooderham presents an exclusive LTD Edition print taken from an original painting of our beloved RVT! The Grade II listed building has become an iconic landmark in the LGBTQ history and culture and would make a memorable gift. The print is beautifully finished on a 310gsm textured gallery paper. Each print is signed and numbered by the artist and the edition is strictly limited to 150 copies. 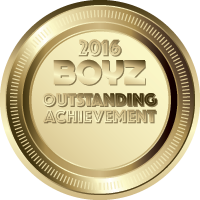 It’s time to vote in the 2017 Boyz Awards. Voting ends soon! The Royal Vauxhall Tavern is the perfect place for your Christmas Party.